• iOS 8 share extension: Share photos, videos, and links right to WhatsApp from other apps. • Quick camera button in chats: Now you can capture photos and videos, or quickly choose a recent camera roll photo or video. • Edit your contacts right from WhatsApp. • Send multiple videos at once and crop and rotate videos before sending them. 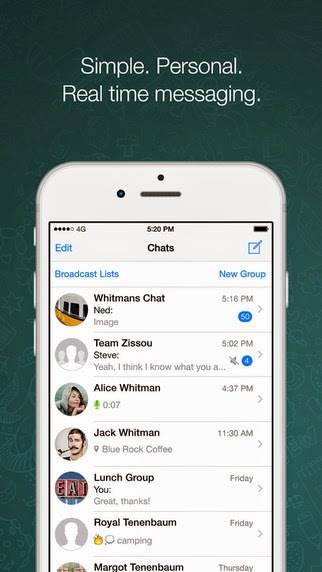 * GROUP CHAT: Enjoy group conversations with your contacts. Add or Remove group participants, change group subject and set a group icon. * NO NEED TO ADD BUDDIES: Your Address Book is used to automatically connect you with your contacts. Your contacts who already have WhatsApp Messenger will be automatically displayed under Favorites, similar to a buddy list. * AND MUCH MORE: Share location and places, Exchange contacts, Custom wallpaper, Custom notification sounds, Landscape mode, Message timestamps, Email chat history, Broadcast messages and media to many contacts at once, and much much more! يتضمن التحديث خيار الغاء الصح الأزرق الخاص بقراءة الرسائل وذلك من خلال اعدادات التطبيق ثم الحساب ومنها خيار الخصوصية. يمكنك مع هذا الاصدار التبليغ عن الرسائل وواصحاب الارقام المزعجة وستتمكن من تحرير الاسماء في قائمة الاصدقاء من داخل التطبيق نفسه. Compatibility: Requires iOS 6.0 or later. Compatible with iPhone. This app is optimised for iPhone 5, iPhone 6, and iPhone 6 Plus. Did you know you can shorten your links with AdFly and make dollars for every visitor to your short urls.